The old page was getting a bit clunky and unorganized. First of all I have a poodle. Sigh. There, I said it.. I am a man with a poodle. I never wanted a poodle but he fell into my lap and I’m keeping him. Anyway you haven’t lived until you have gone camping with a poodle. 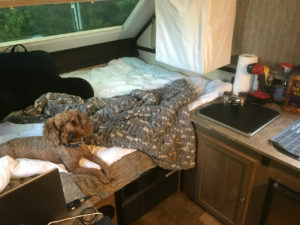 As you can see in the pic he took over the camper. I’m a 50 something from Evansville, Indiana who joined the Navy at age 19 in June of 1982. Fresh out of boot camp I attended Airman School in Great Lakes and was then stationed on CVN-70 USS Carl Vinson in the Airframes shop. Was there until March of so of 1983 where I attended AMS “A” School. Following that I showed up in VA-174 Cecil Field FL where I attended FRAMP, was in 1st LT Div, Phase Shop, then a Plane Capt. and finally ended up in Airframes the last few months of my contract. Got out of the Navy and began working at an FAA Repair Station in Miami Florida. Floundered around in life a couple years, moved back to Indiana and then went back in the Navy in Nov 1988. Was sent to Orlando for NAVET (prior Navy Veterans) training and then to VA-34 at NAS Oceana Virginia. Made a Med Cruise in March to September of 1990 and got out of the Navy for good in November 1990. I absolutely loved the Navy but got out for a variety of reasons, not the least of all which was to try to save a failing marriage. Started working for the US Government in 1990 and have moved around civil service quite a bit. I started as a Wage Grade 7 and now am a GS-13. Civil Service has been great to me and I work in direct support of the military on a daily basis. It’s like being in the military with no haircut, no uniform, and the word “NO” is returned to your vocabulary. It is literally the best of both worlds. And now after wanting an Amateur Radio license since being a teenager I am now licensed as KN4FMV. I have spent about 16 of the last 21 years overseas in Iwakuni and Okinawa Japan for which I feel most fortunate to have done. Those were probably my heydays as now I reside in lovely New Bern North Carolina where I will probably die of boredom. In my 50 something years I’ve learned this: Tubes sound better than Transistors, you can look at a film photo when the computer is broken, and food cooked over charcoal tastes better than on a gas grill.